After a game of pick-up basketball at the overcrowded Student Pavilion, senior Geoffry Patton pointed out one of Temple’s largest expansion problems. LEE MILLER TTN Extensive renovations to Pearson and McGonigle halls may be completed as soon as the summer of 2011. Up is just where Associate Vice President for Facilities Management Andy Riccardi is going with the $48 millon renovations to Pearson and McGonigle halls, originally built in 1968, set to reach completion in 14 to 15 months. The third floor that will be built atop the structure of McGonigle Hall will include four recreational basketball courts, 2,700 square feet of office suites for Campus Recreation and a multi-purpose room for physical therapy and personal training. In a first-ever for the Temple Athletics basketball program, the men’s and women’s teams will have two Division I practice courts in addition to a 7,000 square-foot coaches’ suite. But the renovations, the first leg of the university’s 20/20 plan, will also reach the edge of Broad Street. A 15,000 square-foot, glass-enclosed mezzanine will replace the pre-existing concrete porch area in front of the buildings. Upon entering, patrons will see 12,000 square feet of retail space and a rock-climbing wall. Above the wall will be a cardiovascular workout room. Another workout facility will sit on the second floor of Avenue North at Broad Street and Cecil B. Moore Avenue. 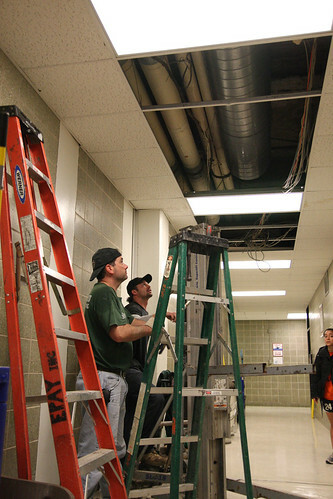 The rest of Pearson and McGonigle halls will get “a face lift” for lighting and ceiling fixtures, Riccardi said. The new facilities will also provide additional opportunities for student workers. Though there have been no definite decisions regarding what retail stores will be installed, university officials confirmed the mixture will consist of a Temple athletic apparel store, a protein drink bar and/or vitamin store, a café and possibly a Modell’s Sporting Goods store. All three departments were consulted during the planning process to find out top priorities. Though Bergman oversaw the process in his previous post as vice president of operations and business services, Riccardi and Director of Planning and Design Tom McCreesh served as the liaisons between Director of Athletics William Bradshaw, Director of Campus Recreation Steve Young and Kinesiology Department Chair Michael Sitler. Though the teams sometimes nab practice space in Pearson 100, which will remain despite the renovations along with the gymnastics and volleyball teams’ gyms, the gym is often used for class instruction or intramural and club sports. The two Division I courts will give the teams practice space with offices for the coaching staffs, including men’s coach Fran Dunphy and women’s coach Tonya Cardoza, who also contributed ideas as to what types of facilities would best suit the direction of the program. Down the hall from gym 100 is the kinesiology department and advising offices for athletes. This area will be gutted to make room for the mezzanine. The offices will be moved to the second floor of Pearson into an 8,000 square-foot suite. The diving pool, one of three pools within Pearson, will be converted to a smart classroom similar to the lecture halls within Alter, Anderson and Gladfelter halls. But from the get-go of the 20/20 plan, Young and the department of recreation were losing something rather than gaining. The Student Pavilion, which mainly houses recreation office space, storage, four hard courts and a driving range, is set to be torn down to make room for the “Signature Building” – said to be a community hub and library to replace Paley – in the 20/20 plan. There is no set date for the demolition of the Pavilion, but within the scope of the plan, the department of recreation will eventually lose court space. H2L2/Planning LLC, the architectural firm that designed Tyler School of Art, scaled down the big picture, which consolidates the recreation office suites – a major need, Young said – and replaced the four hard courts that will be lost when the Pavilion is torn down. It did not include additional fitness space, other than the smaller 2,200 square-foot fitness space above the mezzanine level. The IBC Student Recreation Center, which opened in 1998, saw a 127 percent increase in usage over the past 10 years and is a major need, Young said. But two years ago, before Pearson/McGonigle plans were finalized, Young approached the university about utilizing the 20,000 square-foot second floor of Avenue North as fitness space. Talks began in summer 2009 and the plan to rent the space is unofficially finalized – it first went before the Board of Trustees March 31. Young said the gym is expected to open for the 2010-2011 school year. The smaller 2,500 square-foot gym above the mezzanine level will add to the wow-factor the university is looking to create with its 20/20-plan expansions. While overlooking Broad Street, students will be able to use “green” cardio equipment – a small step toward getting a LEED certification from the U.S. Green Building Council – while they work out. On the back wall of the gym space, at least two speed bags, heavy bags and flat screen televisions for the Wii console system will be available. Depending on the finished product, there may be room for up to two more of each item. “I’ve been here a long time and I constantly get students requesting heavy bags and speed bags,” Young said. The multi-purpose room on the added third-level of McGonigle will have two exam rooms, a stretch area, cardio equipment and a universal strength-training machine. Here, students and faculty can pay to receive personal-training consultations, a service currently unfulfilled. The room will also serve as a club-sport trainer’s hub and a physical therapy site for university employees who need care. Doctors from the Health Sciences Campus will take some appointments at McGonigle. Also on third-floor will be a shared space for the recreation and athletic departments, where club and intramural teams can use for meetings and CPR classes can be held. Not including the furniture, fitness and equipment budget for the recreation department – a figure that has yet to be established – and additional needs of the athletic department’s new facilities, the financing for the renovations of Pearson and McGonigle is coming from three separate places, according to Chief Financial Officer Anthony Wagner. A $13.3 million portion comes from fundraising dollars and $13 million is derived from university reserves – Temple’s savings account. The additional $22 million is left over from the $48 million in 30-year bonds Temple borrowed in 2006 for Alter Hall, Tyler School of Art and Temple Towers. The dedicated practice facilities will be perfect for our already improving basketball teams. Now we just need a change of conference, and we will be regular contenders for the final four !